Send your questions and get them answered! Apply to Be Featured…and Get a free eBook! Have a question about health, diet, exercise, motivation, finding time…or something that’s been bugging you in the area of health and wellness? Why not get it answered straight from a pro—from a woman that’s been in health, fitness and wellness for decades? To be featured and get private coaching from me, apply here to get it answered on Flipping50 TV. 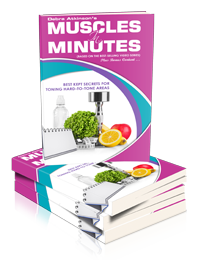 If you are picked to be featured on Flipping50 TV, I’ll send you my eBook, Muscles in Minutes, for free! If you know how to eat, move, and care for your body as you pass birthdays you’ll be one of those women who keeps people guessing about her age, feels forever young, and who radiates joy and confidence. You still got it, girl! On Flipping 50, Debra helps women who want to get and keep their energy and vitality move through changes that come with age, without settling for less energy or more weight. Through a five-part process she helps every woman analyze her nutrition, exercise, sleep, stress and rest so she can balance her hormones and create optimal energy, fitness, and confidence for life. Creating easy, enjoyable, and fun ways to feel better fast, Debra is Flipping 50. Watch all the current and future episodes available right now at FlippingFifty.com. Debra is a proud member of the over 50 club, a Certified Strength and Conditioning Coach, Medical Exercise Specialist, and Wellness Coach. She’s a prior Senior Lecturer in Kinesiology at Iowa State University, an international fitness industry presenter, speaker and author of four books, including the most recent, You Still Got It, Girl! The After 50 Fitness Formula For Women.